I want to recognize the Kitsap Sun’s editorial cartoonist Milt Priggee for capturing the feeling of the moment last week when the final piece of a dam on the Elwha River was blown up. See Water Ways, Aug. 27, 2014. The video below was recorded on that same day by Anne Shaffer of the Coastal Watershed Institute while snorkeling in a kelp bed in western Freshwater Bay, not far from where the Elwha River flows into the Strait of Juan de Fuca. Watching this video and the large number of herring gives me a feeling of optimism, although I recognize there is no scientific basis for this. Someone please tell me the herring are doing better. “We couldn’t think of a better place to be the day the last dam went down,” Anne said in an email to members of her listserv. The Coastal Watershed Institute has been monitoring the nearshore area, where the Elwha River has been dramatically transforming the delta. 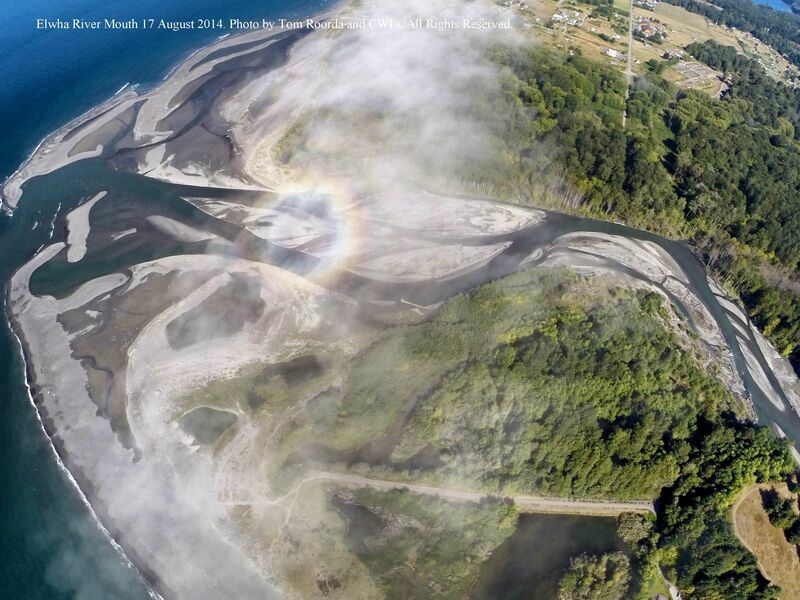 Sediment, unleashed by dam removal, pours out of the Elwha and builds up in the estuary. Tom Roorda, an aerial photographer, has been documenting the transformation with thousands of pictures he has taken over the past several years.